Lacoste Gallery was founded 28 years ago by Lucy Lacoste with a focus on ceramics. 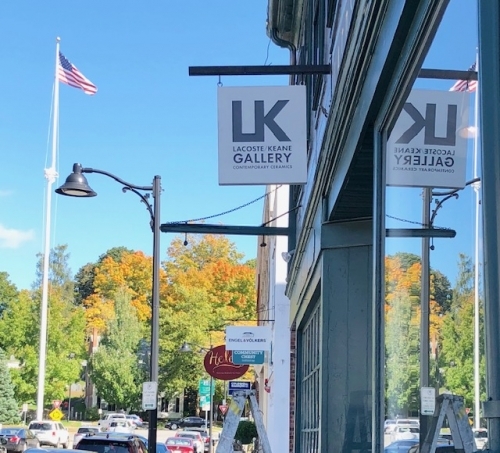 Select exhibitions include Architectural Ceramics: Beyond the Body; Functional Connections with Warren MacKenzie; After Palissy; Generational Crossroads: Bizen Connection; A View from Denmark and the Elusive Teabowl. Artists shown include 20thCentury masters such as Karen Karnes, MacKenzie and Don Reitz. Current leaders in the field such as such as Ani Kasten, Shozo Michikawa Tim Rowan and Hans Vangso are represented from around the world, as well younger artists such as Ashwini Bhat, Natalie Arbelaez and Mike Helke. In May 2018, Lucy joined forces with LaiSun Keane to form Lacoste/Keane Gallery marking a new chapter in this gallery’s life. This gallery remains deeply committed to clay as an art medium focusing on showing contemporary, post WWII ceramic artists both established and emerging. In conjunction with its main ceramic shows, the gallery will present 2-D art focused show several times a year to broaden the dialogue between its ceramic works and audience. In our gallery location, besides showcasing a roster of exciting and thoughtfully curated exhibitions, we also offer for sale functional ceramic works by many well-known potters. Please feel free to reach us at info@lacostekeane.com or call +1 978 369 0278 if you have any inquiry or would like to purchase any work. You may also purchase works on this website directly by clicking “purchase this artwork” which takes payment through PayPal or credit card. Shipping cost is included and will be reflected in the payment page.